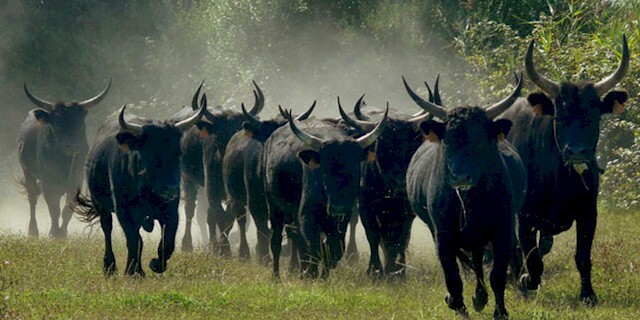 The total population of Brava cattle was estimated at 5950 in 2004. But the number were reported to be 3275 in 2014. They are found in Camargue, Provence-Alpes-Côte d’Azur, Petite Camargue and Occitanie. They are smaller sized cattle. They are variable in color, but most often uniformly black. Both bulls and cows usually have horns. Their horns are large and forward pointing. The horns are creamy grey at the base and usually dark at the tips. Their mucous membranes are dark. As a smaller sized animal average body height of the cows is around 115 cm, and around 125 cm for the bulls. The mature bulls on average weight around 400 kg. And the mature cows on average weight around 250 kg.